Let us solve your training requirements, saving you time and money. ProTrainings are excited to offer discounted rates and custom billing solutions for a variety of online, blended and classroom courses. Our flexible training solutions make training your staff easier and less expensive than ever! Watch the video to learn more about how we can help your business meet its compliance needs. Start saving money. Get an immediate training quote now. Or, for larger group discounts, call us on 01206 805359. Whether you need training for your small business of 5 people, or 500 people, we are happy to quote you a discounted rate for your group. We also encourage informal groups or clubs to contact us and we will arrange discounted training for an instructor to train your group of five or more people. 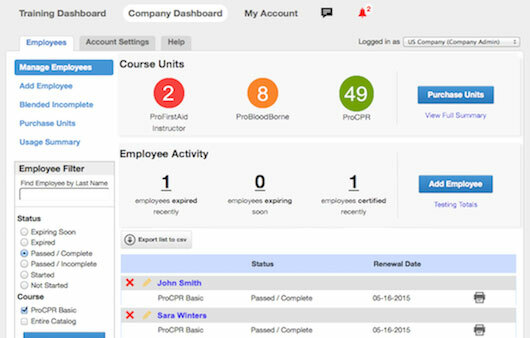 Maintain staff training compliance records with 24/7 access to your students' real-time training records, showing the certification status of each of your staff and their renewal dates. Avoid costly fines and eliminate paperwork by having this information at your fingertips. 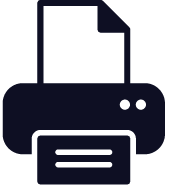 With the Admin Dashboard, you are given administrative access to print extra copies of staff certificates as needed. Certificates are immediately available through the dashboard after the employee has successfully completed the training. Every business has a different requirement for their training and ProTrainings have a solution for any situation. Online video-based courses and blended learning offer the greatest flexibility and cost savings for your business. Classroom courses with our national instructor network provide a more traditional learning solution, or you can train a member of your staff to be an in-house instructor. And with our full range of standard, HSE and regulated qualifications, we are able to meet the compliance requirements for most businesses. Registering your business for an Admin Dashboard means you will be given a special login screen link with your company's logo and contact details. This link can be distributed to staff via email or posted on your website so they will know they are in the right place. Stop worrying about your compliance. Call us on 01206 805359 or request an instant quote. Do you offer pre-purchase or invoicing options for companies? Discount at time of training. Pre-payment by credit card, purchase order, cheque or bank transfer. Monthly invoice in arrears is also available upon qualification, subject to account approval. Can I set up with ProTrainings as a Company but have my staff pay for the course themselves with an arranged discount? Yes. We can set up your admin dashboard and you can make your staff or agency workers pay for the course themselves using your special price. I also need classroom courses. Can you help with this as well? Yes. We have a National network of approved instructors who offer a full range of 100% classroom courses and blended evaluations. Visit our ProCourses website to search for classroom courses and instructors near you. I need a blended course. Can you offer this? Yes. You can do a online course and then a practical evaluation by one of our National Evaluators/Instructors. 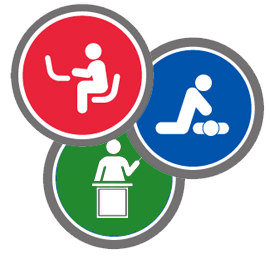 We can even train your in-house trainers to be evaluators for first aid as a blended course. If my group pre-purchases trainings, what is the expiration date? The trainings you purchase do not expire. They are valid even if your staff training is staggered over the next two months, year or three years. I need to train an in-house Instructor in First Aid. Can you offer this as well to complement our online training? Yes. Our sister company, ITG Instructor Training Ltd, are specialists in First Aid Instructor Training and all their courses are integrated with our ProTrainings systems for the classroom and the online courses. Still have questions? Call us on 01206 805359 and we will be happy to help.